dairy and sesame free cooking, dairy free baking, fun arts and crafts for kids..
Yeah yeah, I know. It's probably not a very good idea to repeat recipes on here. But I really just couldn't help myself. We were going to a birthday party and I was making cupcakes for Ian so that he wouldn't be left out and I asked the kids which ones to make and these were the ones that they chose and they are just sooooo good and the picture just came out too great. The end. Combine flour, baking soda, and salt in a bowl. Mix well. On medium speed, beat butter and sugars until light and fluffy. Add the egg and vanilla and continue to beat until well mixed. On low speed, stir in the flour mixture until blended. Add the chocolate chips and stir to integrate them into the batter. Bake for 8-10 minutes. Set the muffins on a cooling rack and be sure to let them cool before you add the frosting, or it will melt. In the bowl of an electric mixer, sift the sugar and the cinnamon. Add the butter, and with the paddle attachment, mix at medium speed until the mixture forms a sort of ball. You will want to drape a kitchen towel over the bowl of the mixer, that is, unless you want to stand in a cloud of sugar... Once the ball forms, turn the speed to low, combine the soy milk and vanilla, and add to the sugar ball a couple of teaspoons at a time. Make sure that the milk is incorporated before each addition. Once all the milk is in, scrape the bowl with a rubber spatula, and turn the mixer up to full speed. Mix until the frosting is light and fluffy, about 5-10 minutes. Scoop the frosting into a pastry bag with a tip, or simply a plastic bag, reinforcing one of the corners with tape. Snip off the corner, and voila, instant pastry bag. Pipe away! Thanks Nina! I sincerely appreciate your comments and support!! 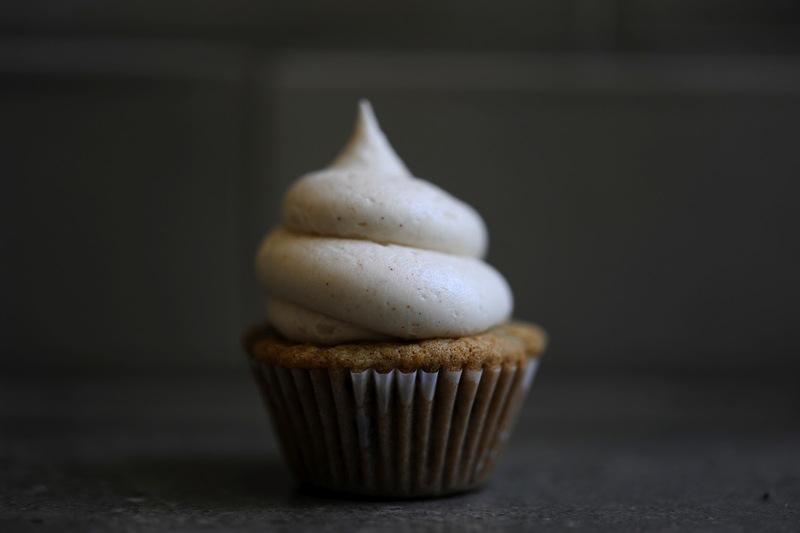 Lovely Vegan mini cupcake, and so cute too, and great photo! I make a lot of dairy free treats too, I am not allergic, although I am a vegetarian (lacto-ovo) and often I make vegan meals, especially if we had lots of dairy products in one meal I try to balance out in other: adults too should limit dairy products, and with me drinking caffellatte every morning, I guess that I end up alway with more than my fair share of it!! Anyway, I will follow you, and come and visit if you like, I run a few blogs but my main one is this one http://alessandrazecchini.blogspot.co.nz/, where I always put my recipes first. There is a vegan and gluten free dessert on today too! Oh, and just for the record, the cupcakes are not vegan- there is one egg in there, but that could be easily switched out with an egg replacer or banana.. oooo banana chocolate chip cookies sound great.. I'll have to try that one! Oh my gods yes. This is too delicious. I am a stay at home mom, artist, advocate, personal chef, mess cleaner, playmate, stuffed animal on demand maker, and occasional chopped liver. And I wouldn't have it any other way! In August of 2010, we found out that our 10 month old had life threatening dairy and sesame allergies. Since I was nursing at the time, I had to make major adjustments not only to his limited diet, but to mine as well. Through all of my research and experimentation, I have found that I really love to cook! Add that to my love of knitting, painting, and crafting, and here you are!